Co-op member, Sabine Barcatta, makes sure all of the art in the gallery is presentable for guest walking through it. She collects pieces for her necklaces and bracelets, then fashions them into wearable art. The Artists’ Gallery in the Bullen Center in Logan, located at 43 S. Main, is a place where a co-op of some 20 passionate fine artists show and sell their work year round. 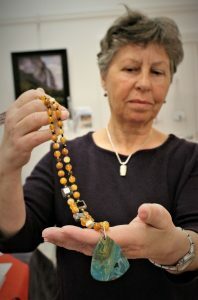 Co-op member, Sabine Barcatta, shows some of the jewelry she made and is on display at the Artists’ Gallery. It looks like a tiny office space with artwork on a couple of walls and some work displayed on shelves. The real treat is the small gallery through the back of the office that displays 70 percent more art. The work is produced by painters, watercolor artists, ceramicists, fiber artists, glass artists, polymer clay artists, jewelers, photographers, and a woodworker. Kristi South, a sculptor and potter, is the chairman of the board for the organization. She said a co-op is an interesting thing, it’s kind of magical. As chairman, South coordinates their efforts with the Bullen Center. She said they are lucky; the Bullen Center folks are such good people to work with. 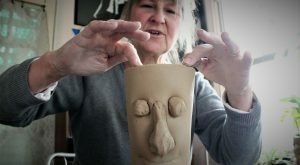 Artist Ktisti South works on a mug with a face she created Monday in the he home studio. South is chairman of the co-op of artists that have their work on a display at the Bullen Center. South’s unique vessels adorned with faces can be found in the gallery. The faces on her pieces give them a personality. Her ceramics career began when enrolled in a ceramics class at Utah State University in the early 90’s. 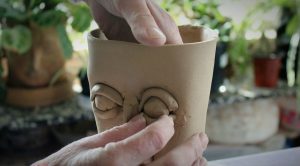 Kristi South a sculptor and potter adds a face on a ceramic mug she is making. Her work is on display at the Artists’ Gallery in Logan. The faces appear on oversized jugs, pots, planters and ceramic Udu’s, or Nigerian ceramic musical instruments. South said artists like her put their work on display so people can enjoy it, it’s not all about selling the piece. Another co-op member, Sabine Barcatta, is a jewelry maker. She collects pieces for her necklaces and bracelets from all over the world, then fashions them into wearable art. 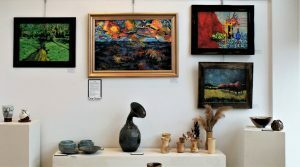 The Artists’ Gallery has work is produced by painters, watercolor artists, ceramicists, fiber artists, glass artists, polymer clay artists, jewelers, photographers, and a woodworker. During the summer, when there are a lot of visitors downtown, the foot traffic is pretty good. The co-op sells a little more work in the warmer weather. The Artist’s Gallery participates in the Gallery Walks, the summer sidewalk sale, the winter gift market, and occasionally organizes their own events. 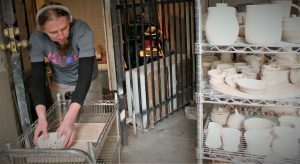 Daniel Bialkowski loads the kiln behind him to fire the many pieces created by other artists at the Bullen Center. Bialkowski is one of the artists who has a display in Artists’ Gallery in Logan. The Artists’ Gallery is open Wednesday through Friday from 11:30 a.m. until 6:00 p.m. and Saturday from 12-5 p.m.